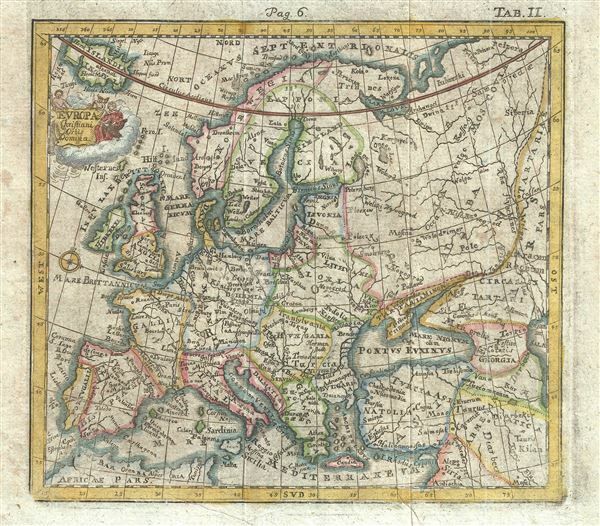 A scarce 1742 miniature map of Europe by German historian Benjamin Hederichs. This map covers the entirety of Europe from the Arctic Circle to the Mediterranean and from Iceland to the Caspian Sea. Also includes adjacent parts of Africa and Asia. Decorative allegorical title cartouche in the upper left quadrant. Published for Hederichs 1742 Anleitung zu den fürnehmsten historischen. Hederichs, B. M. Rect. Schol. Hayn., Anleitung zu den fürnehmsten historischen (Berlin: Ben. Christoph Gottleib Nicol) 1742. Good. Some foxing. Original Folds. Blank on verso.